You must complete all 3 things to qualify for giveaway. Submission deadline is at 11:59pm on Wednesday, October 31, 2108. A winner will be randomly selected and announced on November 5th, 2018. We will post the winners name and contact them through FB messenger so please make sure to follow our page to ensure that you see if you won! 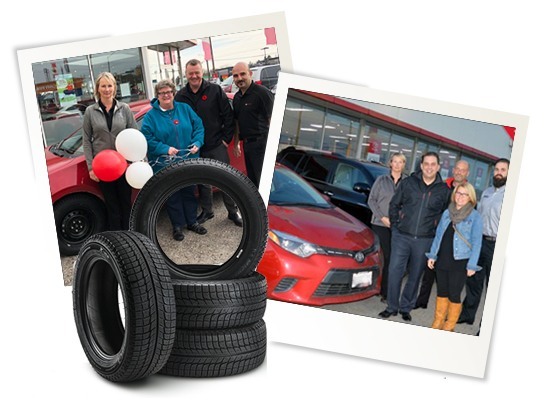 *Client must be 19+ to enter Facebook giveaway and must be able to come to North London Toyota to do tire swap. Includes tire swap and one season of tire storage. Selection of tire brand up to the discretion of North London Toyota staff based on availability. Giveaway does not include rims, tires only ($800 value). No cash value.